E (Europa) was sold for 38p on day of issue. Background colors are printed with Iriodin ink, giving the stamp a three dimensional appearance. Prince William, the first child of the Prince and Princess of Wales, was born atSt Mary's Hospital, London, on 21 June 1982. 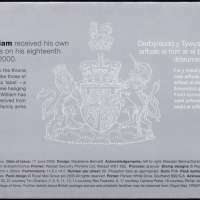 A week later on 28 June his name was announced by Buckingham Palace: William Arthur Philip Louis. 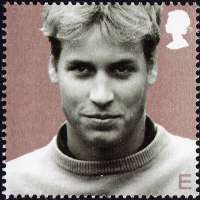 He was baptised in the Music Room of Buckingham Palace on 4 August 1982 (the 82nd birthday of his paternal great-grandmother, Queen Elizabeth The Queen Mother) by the Archbishop of Canterbury, Robert Runcie. 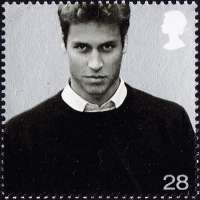 He was the first child born to a prince and princess of Wales since Prince John in 1905. 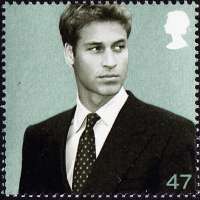 William's first public appearance was on 1 March 1991 (Saint David's Day), during an official visit of his parents to Cardiff, Wales. 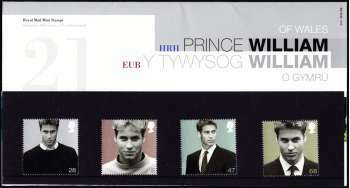 After arriving by aeroplane, William was taken to Llandaff Cathedral where he signed the visitors' book, thereby demonstrating that he was left-handed. 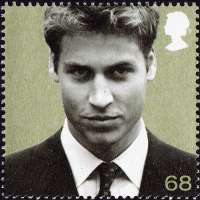 At the age of 21, Prince William was appointed as a Counsellor of State, and began his royal duties by first serving in that capacity when the Queen was in Nigeria to attend the Commonwealth Heads of Government Meeting 2003. For his 21st birthday, William accompanied his father on a royal tour of Wales, visiting the Anglesey Food Fair and opening a centre for the homeless in Newport.